There is a lot of research in artificial intelligence or robotics in the developed world. But Bangladesh is lagging behind in this sector. So to give information about this technology to students, Chittagong University of Engineering and Technology (CUET) held seminar on 'Artificial Intelligence, Machine Learning and Robotics' held on Sunday. The seminar was arranged in the Computer Department of CUET. In collaboration with the Bangladesh Robotics Foundation. The media partner of the event was a news media techshahar.com. In the speech of the chief guest. Md. Saiful Islam said, artificial intelligence is being transformed into a great industry to advance the technology of the present world. Its use has become increasingly popular in large-scale industries of the world. It is possible to complete many complex tasks in a timely manner by establishing artificial growth in robots or machines. That is why demand of the day is increasing. Professor Dr. Mohammad Shamsul Arefin said that the artificial growth in art companies, corporate offices and marketing companies has not spread so far in our country. In this case, there is a great opportunity for computer engineers to work. CUET students can also use this opportunity. 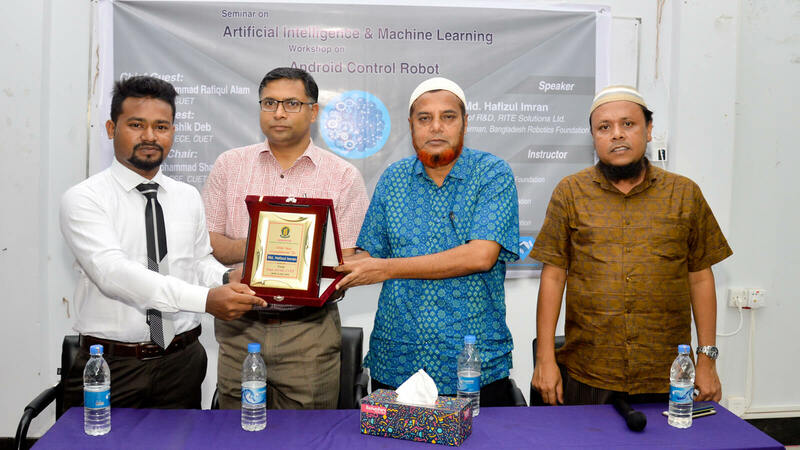 Bangladesh Robotik Foundation Founder Chairman of the seminar Hafizul Imran highlighted the importance of Artificial Intelligence (AI) and machine learning. Also explain how students are starting to work on this technology. Certificates and certificates were distributed among the students after the seminar and workshops. Besides, BD Speedy Tech was supported in cooperation.